How do you pull off a black and white vertically striped suit? That would usually be a tough question to answer, but when you're decked out in this Plus Size Beetlejuice costume, you'll have plenty of stylishly spooky swagger to make it work! This may come as a shock, but the afterlife is a bit limited in terms of wardrobe options. Ghosts and ghouls are basically limited to wearing whatever they had on when they met their demise. New fashion trends are also slow to catch up with the times, since many spirits' clothes tend to be burnt, waterlogged, or have tire marks all over them, depending on how they bought the farm. 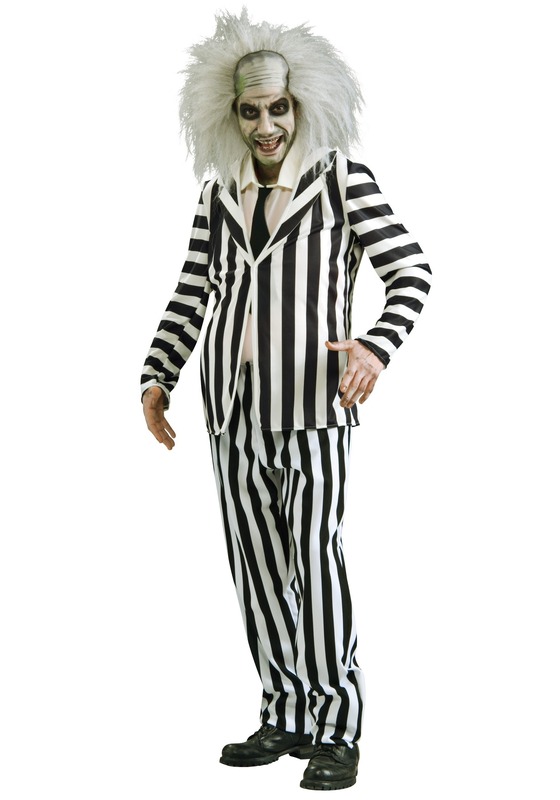 We have no clue where Beetlejuice got his wacky striped threads from, but whether that's what he was wearing when he became a ghost or he found them sometime after, they make him look pretty good for a sleazy poltergeist who's been dead for hundreds of years. Putting this costume on won't give you command of supernatural forces or let you turn into a giant snake. But dressing up in the wild looking outfit the "B-Man" is wearing in the movie will give you the swagger to cause some mischief and play pranks on your friends. If you want to really scare them out of their socks, put on a matching wig and some pasty white makeup, sneak up on them when they are all eating dinner, and start playing "Day-O" really loudly. We know it wasn't Beetlejuice that did that in the movie, but it's still a hilarious scene... wait, did we just say his name a third time?